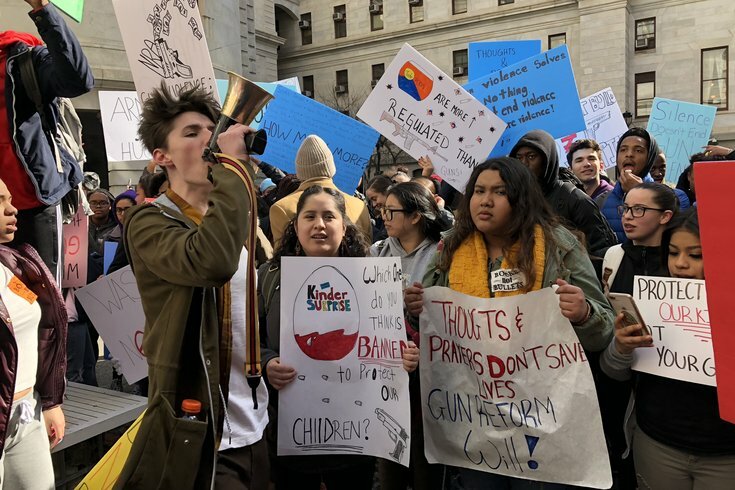 Hundreds of students protest gun violence at Philadelphia's City Hall, shouting 'never again, and 'we want change' after walking out of school on Wednesday morning. 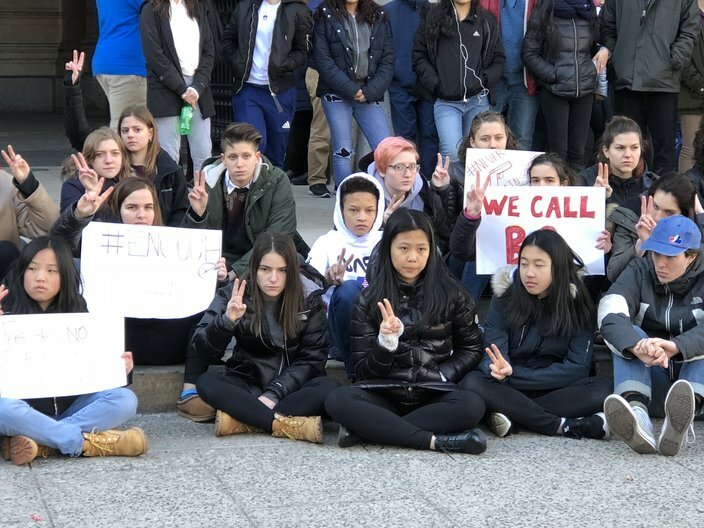 Hundreds of Philadelphia students converged on City Hall on Wednesday morning, abandoning class to call for stronger gun laws in the wake of the mass school shooting in Parkland, Florida. As students from several nearby high schools gathered in the courtyard, they shouted "We want change," "How many more?" and "Together we stand, we want the guns banned." Their voices echoed off the sides of City Hall as they hoisted dozens of signs decrying gun violence and urging Congress to take action. Parkland survivor's speech inspires veteran to turn in his AR-15. "Having everyone here in unity really says something about the issue," said Lilly Roman, a junior at Science Leadership Academy in Center City. She and her friend Bronwyn Goldschmeider held a sign reading "You fear we'll take your guns, We fear you'll take our lives." The rally was just one of countless National Walkout Day demonstrations staged by students across the United States on the one-month anniversary of the shooting at Marjory Stoneman Douglas High School, which killed 17 people, most of them students. Students from the Academy at Palumbo, Franklin Learning Center, South Philadelphia High School, Friends Select School and Constitution High School and the Philadelphia High School for Creative and Performing Arts also descended upon City Hall. Alicia Moore, a junior at FLC, said she walked to City Hall with about 100 of her classmates, joining with students from Benjamin Franklin High School and Parkway Center City. In protesting, Moore said she hoped it would shine a greater light on gun violence. "I wouldn't want to see teachers get guns," Moore said. "That's super scary. Overall, I'd just like to see it stop." Prior to walking to City Hall, many students held demonstrations outside of their own schools. Students at Friends Select School, a Quaker school located along Benjamin Franklin Parkway, walked the few blocks to City Hall. There, they spent 17 minutes sitting in silence on the north side of the municipal building – one minute for each of the victims killed in Parkland. At varying times, students stood up to call out the name of one of the victims. Many of them flashed the peace sign or held signs that read "We call BS," and "Protect kids not guns." To close the demonstration, a student with a megaphone stood up and said "We need action now. Congress do your job. Act to save our lives." Dalia Bender, a junior at Friends Select, said youth taking action is not a new phenomenon. Rather, she said they're finally being given a platform. "It just shows the power of young people right now in that we're determined to get this done, even if the adults in Congress can't do it. I'm not surprised by the students at Parkland," Bender said. "I know that my generation is capable of that. I'm just happy that the media is giving the platform for us to speak and make a difference." Students from Friends Select School protest gun violence by sitting in silence for 17 minutes – one minute for each of the victims killed during the shooting in Parkland, Florida last month. Bender called for lawmakers to ban bump stocks and raise the legal age for purchasing a gun. Other students urged Congress to ban military-style rifles or take other action. Sarahs Perry-Anderson stressed the need for a bipartisan approach to gun violence, urging Republicans to join Democrats in pushing for stronger gun laws. "There were 15,000 gun deaths in the U.S. last year," Perry-Anderson said. "If that many people had died in plane crashes, there would be sweeping reform to plane regulations and what it took to be a pilot. Nothing's been done with guns." Florida Gov. Rick Scott signed a gun bill last week that raises the age to purchase a firearm, requires a three-day waiting period and bans the sale of bumpstock firearms. It also provides funding to arm school resource officers. Lydia Shaw, a senior at Friends Select, said she mostly was encouraged by the gun bill passed by the Florida legislature. "While I don't agree with the arming of teachers, it's been really inspiring to see that, at least, something has been passed," Shaw said. "That's giving me a lot of hope to see that there already is change being made and that we, as students, are helping that. Senior Angelina Han, 18, president of student government at Upper Dublin High School, speaks to students on Wednesday morning during the school's participation in National Walkout Day to raise awareness of gun violence and the need for gun control in the wake of the Parkland mass shooting. Students at suburban Philadelphia schools also participated in the national day of awareness. In the Abington School District in Montgomery County, for instance, students at the senior and junior high schools not only honored the memory of the Parkland victims for 17 minutes on Wednesday, but produced a video to say "Enough is enough" and encourage peers to ensure that gun violence in schools never happens again. Students are taught to stand up for the things they believe, said Shaw, the Friends Select senior. By walking out of school on Wednesday, students were putting that lesson into practice. "As a Quaker school, it's important to do that non-violently," Shaw said. "Violence may draw attention, but non-violent protests – that's something that can really make a change without necessarily hurting anyone."